The black widow is genus of venomous spiders that mainly live in warm, dark secluded places.The black widow is not an aggressive spider but it will attack if it feels like it is in danger. It is a nocturnal spider. 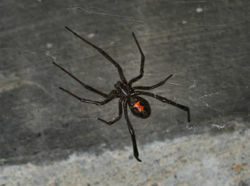 The black widow lives all around the world in warmer climates. The female black widow is poisonous, it's venom is 15 times more toxic then that of a rattle snake, but due to the small amount of poison that the black widow injects, it is not as deadly. Before they created an anti-venom, 5% of all people bitten died from the spider's bite. The female black widow is much larger then the male. 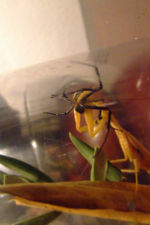 The female is approximately a half of an inch in diameter. It can be distinguished by the red hour glass looking design that it has on its abdomen. The males are much smaller and do not have the red hour glass design. They are usually all black with no change in color. They also have pedipalps that are on the spider's head, the females do not have this The males have no venom and do not pose a risk to humans. The males have smaller bodies but have legs that are longer. They have yellow and red stripes and dots on their abdomens. When the male and females are still in their immature forms they pose no risk to humans and they both look like a mature male. Black widows reproduce sexually. The reproduction of a black widow takes place when the male black widow becomes fully grown. When its grown up it will spin a web that he will then inject sperm into. It will then put some sperm onto its palpa (his male reproductive organ). The male black widow will then go and search for a mate. When he finds a female black widow, courtship begins when the male black widow takes his palpa organs and places them in the female’s reproductive organs called spermathecal openings. During this process, the spermatozoa, from the spermathecal openings, are placed on the eggs and the eggs are put into a egg sac on the spiders web. The female spider will then protect the eggs until the baby spiders hatch. A back widow may lay up to 750 eggs in a summer. Each of these egg sacks are about one-half inch in diameter. Only 1-12 of the immature spiders survive due to the cannibalization of other immature spiders.In somewhere from six to nine months the immature spiders will be sexually mature enough to mate. The black widow's environment consist of the warmer parts of the world.The black widow will catch its prey mainly on its strong, durable, and well built web. Its diet consist of small insects that it catches on its web. The black widow prefers to have its web in a dark, secluded place to keep away from danger. The black widow tends to not be a very aggressive spider. It is shy and will only attack when it feels like it is in a dangerous situation. The black widow is a nocturnal creature and doesn’t come out much during the day. The venom of the black widow is a neurotoxin that attacks the nervous system of its prey.The venom of the black widow is about 15 times more venomous then a rattlesnake's venom. Death from the black widow is rare, this is because not very much venom is actually injected into to a victim.Only about 1% of reported black widow spider bites have been proven deadly. 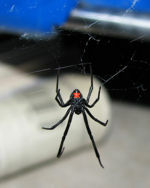 The symptoms of a bite from the black widow are a rise in blood pressure, pain in the feet, being paralyzed in the abdominal area, a dry mouth, sweating, and the area around the eyes may swell up.If let untreated, without hospitalization, the symptoms may last for up to 5 days with weeks of recuperation. A picture of an immature black widow. (Latrodectus hesperus) Over time, the body turns black, with the red hourglass on the underside. Picture of the black widow waiting for prey to be caught in its web. Black widow and egg sac. Species Latrodectus mactans- black widow spider. This page was last modified on 9 January 2009, at 20:06.